Jake Christopher Delhomme (/dəˈloʊm/; born January 10, 1975) is a former American football quarterback who played professionally in the National Football League (NFL). Delhomme played college football at the University of Louisiana at Lafayette, then known as the University of Southwestern Louisiana, before being signed by the New Orleans Saints as an undrafted free agent after the 1997 NFL Draft. Delhomme began his professional career as a practice squad player with the Saints in 1997 and 1998 and played in the NFL Europe for two years in between NFL seasons. Returning to the Saints, Delhomme played his first NFL games in 1999. Delhomme played as the Carolina Panthers starting quarterback from 2003 to 2009. Delhomme held most of Carolina's quarterback records until Cam Newton broke most of them. Delhomme led the team to Super Bowl XXXVIII in his first season with Carolina. After his departure from Carolina, Delhomme also played for the Cleveland Browns in 2010 and Houston Texans in 2011. Delhomme was born to Jerry and Marcia Delhomme, both Cajuns. Jake's grandfather bred horses, and Jake's father was a jockey who began racing at eight years old. Jake has called horses his "first love", and today he, his father, and his brother own and train thoroughbreds. Delhomme played both quarterback and defensive back for Teurlings Catholic; he made the all-state team in high school not as quarterback, but on defense. In addition, Delhomme was a scholar serving as Senior Beta Club president of his chapter in Louisiana. Delhomme played college football for the University of Louisiana at Lafayette, then named the University of Southwestern Louisiana, his mother's alma mater. The only true freshman quarterback to start for a Division I school in 1993, his passer efficiency rating ranked second among NCAA freshmen quarterbacks. Playing on a team with future NFL wide receiver Brandon Stokley and offensive lineman Anthony Clement the Ragin' Cajuns won the Big West Conference twice, and finished with three winning seasons. During his senior year, he led the Ragin' Cajuns to an improbable win over highly favored Texas A&M 29–22. Delhomme finished his career as the school's all-time passing leader in yards and touchdowns. He started the last 43 games of his career, which was the longest among active quarterbacks at the time. Upon graduating, he was ranked 22nd in NCAA history for passing yards and 28th in total offense. He was inducted into the school's Athletic Hall of Fame in 2006. Following his success in Europe, he was brought back to New Orleans as the full-time third-string quarterback. In his first NFL start against the Dallas Cowboys, he threw two touchdowns en route to a Saints victory, the team's third. Delhomme played seven seasons with the Carolina Panthers from 2003 to 2009, including an appearance in Super Bowl XXXVIII. With Aaron Brooks cemented as the starter in New Orleans, Delhomme was interested in fighting for a starting spot in the NFL. In the 2003 offseason, he met with representatives from both the Carolina Panthers and the Dallas Cowboys. He eventually signed with Carolina as a free agent. It was his performance against Dallas in 1999 that made new Panthers coach John Fox take notice. The Panthers had been struggling, and were just one season removed from a dismal 1-15 season, during which they set a then-NFL record for consecutive losses in a single season. Although Rodney Peete was the Panthers' starter, Delhomme was looked at to be the future of the franchise. It did not take long for him to take over. The 2004 season proved bittersweet for Delhomme, as he posted career highs in pass attempts, completions, overall yardage, and touchdowns. Unfortunately, the team was stricken with injuries, fielding five different combinations in their offensive line alone. Starting the season 1–7 after the early losses of running backs Stephen Davis and DeShaun Foster, as well as Steve Smith, their leading wide receiver, the Panthers rallied for a fantastic second half of the season. Delhomme finished the final eight games of the season with a passer rating of 102.8, fourth best in the league during that period. He also threw 17 touchdowns and just 4 interceptions en route to winning six of their last eight games. They ultimately positioned themselves for a playoff berth, but lost that chance with a final game loss to Delhomme's former team, the New Orleans Saints. 2005 saw Delhomme return the Panthers to the playoffs. In addition to the team's success, Delhomme had one of his most productive seasons as a quarterback. His 11 victories as a starting quarterback set a team record (later to be broken by himself in 2008 and again by Cam Newton in 2015) and he set career highs in completion percentage (60.2) and passer rating (88.1). In addition, his success led to Steve Smith leading the league in receptions, receiving yards, and receiving touchdowns, becoming only the third wide receiver to accomplish the "triple crown" in league history. Once again, he led the Panthers through the playoffs, including a shutout of the New York Giants, although the team ultimately fell to the Seattle Seahawks in the NFC Championship game. Delhomme started the 2006 season as the Panthers' quarterback, the first time in franchise history that the same quarterback was the starter for three straight seasons. He set records during the season by making 150 consecutive pass attempts without an interception, bettering Steve Beuerlein's previous team record. The following week against the Washington Redskins, he continued his assault on the team record books by breaking Beuerlein's records for completions and passing yards. Unfortunately, he injured his thumb in a game against the Philadelphia Eagles, and missed three games. During his time off, Chris Weinke started for the first time since the 2002 season, and in his first game shattered the team record for passing yards in a single game with 423 yards, but his three interceptions cost the Panthers the game against the New York Giants. Weinke could only manage a single victory in Delhomme's absence (against the rival Atlanta Falcons, only his second victory as an NFL starter), and Delhomme returned for the season finale against the New Orleans Saints. The 2007 season started with a win against the St. Louis Rams and a loss to the Houston Texans. However, in the third game of the season (against division rival Atlanta Falcons), Delhomme suffered an elbow injury that would set off a series of changes for the Panthers at the quarterback position. David Carr, who signed with Carolina in the off-season, took over as the Panthers' starting quarterback. After Carr injured his back in a defeat of the New Orleans Saints, the Panthers signed Vinny Testaverde, who started the next game against the Arizona Cardinals just four days later, and in the process became the oldest starting quarterback to win a game in the NFL. However, an injury to Testaverde coupled with Carr's spinal cord injury led to rookie Matt Moore starting in week 15 against the Seattle Seahawks, a game he won. Meanwhile, Delhomme opted for season ending Tommy John surgery on the elbow after two weeks of testing his arm. Delhomme prepares to pass in a game against the Chicago Bears on September 14, 2008. Delhomme returned to the starting position for the 2008 season. In the first game of the 2008 season, Delhomme restarted his career by coming back on the San Diego Chargers with a touchdown pass on fourth down as time expired to win the game. This is similar to his debut game in 2003. 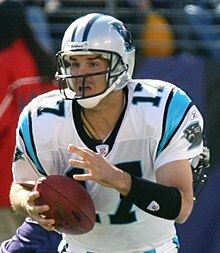 After finishing the regular season 12-4, tying the Panthers' 2nd best record in franchise history, the Panthers were eliminated from the playoffs when on January 10, 2009, on his 34th birthday, Delhomme threw for a career worst five interceptions (and lost one fumble) against the Arizona Cardinals in the divisional round of the playoffs, ending the season with an overall record of 12-5 including the loss in the playoffs. On April 23, 2009, the Panthers signed Delhomme to a 5-year extension worth $42.5 million, with a $20 million guarantee, putting him under contract through 2014. In the season opener loss against the Philadelphia Eagles, Delhomme went 7 of 17 for 73 yards with four interceptions and a lost fumble, before getting benched for journeyman Josh McCown. Delhomme threw game-ending interceptions the next 2 games, and despite throwing for 2 touchdowns and 7 interceptions with a 54.3 rating through the first 3 games, coach John Fox kept Delhomme as the Panthers' starting quarterback. Steve Smith jokingly told Delhomme after their loss against the Eagles "I never liked you as a quarterback." After the team's bye week, Delhomme still struggled. His next three games gave him 2 more touchdowns to 6 more interceptions. In the next four games however, Delhomme would only throw 1 interception. In spite of this improved performance, the team went 2-2 in those 4 games. Delhomme's bad performance continued with a 0 TD, 4 INT game against the New York Jets. During the loss to the Jets, Delhomme broke a finger on his throwing hand and was replaced by backup Matt Moore for the next two games, a 16-6 win over the Tampa Bay Buccaneers and a 20-10 loss to the New England Patriots. After those games, Moore started to heat up. He beat the Minnesota Vikings 26-7, then beat the Giants in their final game at Giants Stadium with a 41-9 win, and went on to beat the New Orleans Saints 23-10. Delhomme was placed on season-ending injured reserve on December 24, 2009, and was released by the Panthers on March 5, 2010. On July 28, 2011, he was released by Cleveland. Delhomme played for the Houston Texans in the 2011 season. Delhomme signed with the Houston Texans on November 29, 2011, after quarterbacks Matt Schaub and Matt Leinart went down with season-ending injuries. Despite his experience, Delhomme was signed to back up rookie fifth-round draft pick T. J. Yates, as Yates had been with the team the entire season. Delhomme entered the Texans' season finale against the Titans after Yates suffered a bruised throwing shoulder. He would go on to lead his team on a potential game-winning drive, completing 18 of 28 passes for 211 yards and a touchdown. But the Texans would lose 23-22 after a botched snap on a two-point attempt play. After the season ended, Delhomme told media that he would most likely retire. 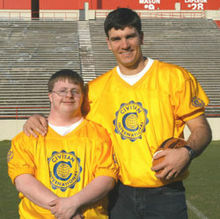 Delhomme (right) and his cousin Kevin Melancon promoting the work of Civitan clubs with developmentally disabled people. Delhomme married the former Keri Melancon in 2000; the two were childhood sweethearts, and were "Junior Sweethearts" at Teurlings Catholic. They have two daughters: Lauren Elizabeth, who was born on December 17, 2001, and Lindsey Marie, who was born on February 25, 2007. The Delhommes are devout Roman Catholics. Delhomme wears #17 because it is the date of his first daughter's birthday, and she was born after 17 hours of labor. He and his family are Panthers fans. After retiring from football, Jake spends his time breeding, buying and selling racehorses like his father and working in the banking industry. Delhomme has garnered popularity as a pitch-man for the fast food restaurant, Bojangles', where he is often depicted as a single-minded fried-chicken addict who audibles Bojangles' "fixin's" at the line of scrimmage. One commercial parodies the film Jerry Maguire and the line "Show me the money! "; former teammate with the Panthers Steve Smith is featured in a cameo. Another commercial with Smith portrays the duo as the Dukes of Hazzard, driving The General Lee with a large chicken head on the roof. Delhomme has also done SunCom Wireless limited edition cell phone commercials that feature a Panthers logo and his signature, and he has appeared in public service announcements for Civitan International. Delhomme is noted for licking his fingers before every play, and sticking his tongue out as part of his focus. The official Panthers website featured a regular discussion with Delhomme during the regular season, known as "Cajun Up with Jake". ^ a b c d e Jon Saraceno (January 24, 2004). "Delhomme's Cajun spice is just nice". USA Today. Retrieved September 6, 2007. ^ a b "Jake Delhomme". NFL Players.com. Retrieved September 6, 2007. ^ a b c d e f g h i j k l m n o p "Jake Delhomme". Carolina Panthers. Archived from the original on November 27, 2009. ^ a b "Interview with Jake Delhomme". Louisiana Department of Agriculture & Forestry. March 4, 2004. Archived from the original on December 26, 2007. Retrieved September 6, 2007. ^ "Former Athletes to be Inducted into Hall of Fame". University of Louisiana at Lafayette. October 18, 2006. Retrieved January 26, 2008. ^ "Jake Delhomme". sports-reference.com. Sports Reference LLC. Archived from the original on March 20, 2016. Retrieved September 3, 2016. ^ Gold, Jon. "10 years after NFL Europe's demise, alumni remember league fondly". ESPN. Retrieved June 30, 2017. ^ "Early Start to Week Two". Our Sports Central. April 17, 2007. Retrieved September 6, 2007. "Pat Barnes and Jake Delhomme split playing time right down the middle and famously became known as the "Double-Headed Quarterback Monster." ^ "First and Ten: Jake Delhomme". IGN. January 4, 2004. Retrieved September 6, 2007. ^ Ryan McPherson (September 24, 2004). "The Real Deal:Jake Delhomme". Scout.com. Archived from the original on October 2, 2007. Retrieved September 6, 2007. ^ a b c "A Rising Star in the NFL". Acadiana Profile. February 2004. Archived from the original on September 29, 2007. Retrieved September 6, 2007. ^ "First and Ten: Jake Delhomme". IGN. January 5, 2004. Retrieved September 6, 2007. ^ "Patriots whip Panthers 38-6, clinch AFC East title". Sports Illustrated. January 6, 2002. Retrieved September 6, 2007. ^ "NFL Game Center:Box Score - Jacksonville Jaguars at Carolina Panthers". September 7, 2003. Archived from the original on December 26, 2007. Retrieved September 6, 2007. ^ Alex Gordon (May 2004). "Hockey Digest analysis: the season after". Hockey Digest. Archived from the original on March 11, 2007. Retrieved September 6, 2007. ^ "Panthers stun Rams 29-23 in double overtime". Sports Illustrated. January 11, 2004. Retrieved September 6, 2007. ^ "ESPN-Jake Delhomme". ESPN.com. Retrieved September 6, 2007. ^ "NFL Recap: San Diego at Carolina". Sports Illustrated. October 24, 2004. Retrieved September 6, 2007. ^ "NFL Recap: Green Bay at Carolina". Sports Illustrated. September 14, 2004. Retrieved September 6, 2007. ^ "NFL Recap: New Orleans at Carolina". Sports Illustrated. January 2, 2005. Retrieved September 6, 2007. ^ "Steve Smith". Panthers.com. Archived from the original on September 27, 2007. Retrieved September 6, 2007. ^ "Box Score=Carolina at Seattle". Sports Illustrated. January 24, 2006. Retrieved September 6, 2007. ^ "NFL Game Center: Game Recap: New York Giants at Carolina Panthers". NFL.com. December 10, 2006. Archived from the original on December 26, 2007. Retrieved September 11, 2007. ^ "NFL Game Center: Game Recap: Carolina Panthers at Atlanta Falcons". NFL.com. December 24, 2006. Archived from the original on December 26, 2007. Retrieved September 11, 2007. ^ "Panthers capitalize on Falcons' penalties in victory". NFL.com. Associated Press. September 23, 2007. Archived from the original on October 11, 2007. Retrieved October 8, 2007. ^ "NFL Game Center: Game Recap - Carolina Panthers at New Orleans Saints". October 7, 2007. Archived from the original on October 11, 2007. Retrieved January 26, 2008. ^ "NFL Game Center: Game Recap - Carolina Panthers at Arizona Cardinals". October 14, 2007. Archived from the original on January 25, 2008. Retrieved January 26, 2008. ^ "NFL Game Center: Game Recap - Seattle Seahawks at Carolina Panthers". December 16, 2007. Archived from the original on January 19, 2008. Retrieved January 26, 2008. ^ "Foxhole: Delhomme to have surgery". Panthers.com. October 8, 2007. Archived from the original on October 11, 2007. Retrieved October 8, 2007. ^ "Panthers lock up QB Delhomme through 2014 with five-year extension". Nfl.com. April 23, 2009. Retrieved November 5, 2010. ^ "Smith to Delhomme: "I never really liked you as a quarterback" - WBTV 3 News, Weather, Sports, and Traffic for Charlotte, NC". Wbtv.com. Retrieved November 5, 2010. ^ "Carolina Panthers put Jake Delhomme on IR - ESPN". Sports.espn.go.com. December 25, 2009. Retrieved November 5, 2010. ^ "Cleveland Browns, Jake Delhomme agree to deal - NFL News - FOX Sports on MSN". Msn.foxsports.com. March 13, 2010. Retrieved November 5, 2010. ^ "Delhomme sees end of road, but being with Texans a 'great' experience". Houston Chronicle. January 16, 2012. Retrieved October 24, 2013. ^ "Alumni 1992". Teurlings Catholic High School. Archived from the original on December 26, 2007. Retrieved September 10, 2007. ^ "Where Are They Now: Jake Delhomme". Carolina Panthers. Archived from the original on October 30, 2015. Retrieved October 29, 2015. ^ "Delhomme's Player Profile". Thehuddle.com. June 16, 2006. Retrieved November 5, 2010. ^ "Jake Delhomme PSA". Archived from the original on May 10, 2011. Retrieved November 5, 2010. ^ David Fleming. "Delhomme is finger-licking good". ESPN.com. Retrieved November 13, 2008. ^ Andrew Mason (July 27, 2008). "Mason's Minutes: Monday Quick Hits". Panthers.com. Archived from the original on August 8, 2008. Retrieved November 11, 2008. "If one ever writes a Panthers encyclopedia, the entry under the word "concentration" will have a picture of Jake Delhomme with his tongue out." Wikimedia Commons has media related to Jake Delhomme.